While the Nintendo 64 wasn’t the most revolutionary home console, the clunky cartridge-based system still managed to house some of the best games of the mid-to-late ‘90s. Quite a few N64 classics, including Super Smash Bros., Donkey Kong 64, and Pokemon Snap, will celebrate their 20th anniversaries in 2019. Joining these memorable 64-bit outings is a wonderfully quirky snowboard racer that the general gaming public seems to have forgotten. Those who grew up with the Nintendo 64 may recall the system’s shockingly expensive games. A new N64 cartridge ran anywhere from fifty to eighty dollar, with most games falling somewhere in between. In 2019 that equates to nearly $100 a game. My brothers and I owned our fair share of must-play hits like Super Mario 64, The Legend of Zelda: Ocarina of Time, and Star Fox 64, but more often than not our parents would suggest we simply rent a game for a little while, instead of exhausting our meager savings. Old Towne Video was our video and game rental spot of choice in my hometown. Though it had a smaller selection than the local Blockbuster, Old Towne Video always had more obscure and interesting offerings. It was the shop where I discovered cartoon classics like My Neighbor Totoro and Rikki-Tikki-Tavi, two of my animated favorites to this day. Old Towne Video’s gaming section was also full of titles that my brothers and I hadn’t seen for rental anywhere else. Our go-to was a snowboard racing game by the name of Snowboard Kids 2. When Old Town Video closed its doors in late 1999, my parents were smart enough (and kind enough) to swing in and pick up a few Nintendo 64 games on the cheap, including Snowboard Kids 2. The game soon became one of our most-played N64 titles, accompanying us to various sleepovers and hang outs around the neighborhood. Snowboard Kids 2 was a hit among our friends and family members, but we never met another Nintendo 64 owner, young or old, who could count the game as part of their collection. It always seemed odd to me, even as a child, that such a beloved multiplayer title could be so overlooked. The original Snowboard Kids, released in early 1998, was declared by many magazines and budding gaming sites to be, “Mario Kart on ice.” Of course, this comparison was a bit of an oversimplification. Much like Mario Kart, players raced opponents through tricky courses as they attempted to gain the upper hand with shortcuts and power-ups, but Snowboard Kids added an extra layer of strategy to the average downhill competition. Racers had to pull off basic flips and spins or collect shiny currency as they shredded the slopes to increase their coin count. It was only with coins that players could grab the sparsely-spaced power-ups. Players could also hold both a “shot” and “item” power-up at the same time, a double power-up feature Mario Kart wouldn’t attempt until Double Dash!! for the GameCube. Snowboard Kids was a solid game, and it apparently sold well enough that developer Racdym (now known as Racjin) and publisher Atlus decided to pump out another entry in the series. Snowboard Kids 2 launched in Japan in February of 1999, with North American and Australian versions dropping in March and April respectively. It was a sequel that played it safe, but one that still managed to tweak the original game’s main snowboarding mechanic, as well as introduce interesting new courses and modes. As a child, my favorite part of Snowboard Kids 2 was the game’s goofy characters, every one of them brimming with their own over-the-top personality. Like most competitive multiplayer games, each character was saddled with a special skillset that was supposed to set them apart. Slash was the all-around type, Tommy was heavy and fast, Nancy was adept at pulling off tricks — everyone had their pros and cons to consider. The characters even had special skins that could be unlocked, including summer, space, and Halloween outfits. My character of choice was always the genius inventor Wendy, who I decked out in pirate gear and equipped with the wicked Dragon snowboard. Like Snowboard Kids before it, Snowboard Kids 2 didn’t simply resign its racers to snowy environments. Slash and the gang could shred down grassy jungle paths, through ancient castles, and even deep below the waves. There may have only been nine full courses in the game, but they were so staggeringly unique and memorable that playing through them over and over never grew tiring. Each course also coincided with the game’s hokey story, a mishmash of character interactions and shenanigans that helped introduced new mini-games and bosses. The cutesy visuals and madcap racing of Snowboard Kids 2 was all tied together by cartoony sound effects and a wonderfully upbeat soundtrack. The menu music was catchy, the character voices were distinctive, and each course’s theme gave players the perfect mix of frantic and fun. To this day I find myself humming the tune from the character select screen and tapping out the boisterous beats from the games’ snow-covered first course, Sunny Mountain. Snowboard Kids 2 was great because it was a game that didn’t take itself too seriously. Players could challenge a dog, a penguin, and a demon child to a downhill snowboarding race through a haunted mansion, and no one blinked an eye. It’s was the right kind of weird, and that’s what set it apart. When Snowboard Kids 2 initially hit store shelves, it did so with little fanfare. There were no cardboard cutouts on the show floor or commercials promoting the game to the Nintendo 64 fanbase. Reviews for the game were mixed, sighting improved content, but “more of the same” when compared to the original Snowboard Kids outing. Looking back on the reviews for the game now, it’s difficult to see exactly why it scored so low, especially when compared to other games of the time. Snowboard Kids 2 wasn’t without its flaws, but it still managed to find a enjoyable middle ground between the high-speed competition of Mario Kart 64 and the more light-hearted story elements featured in Diddy Kong Racing. 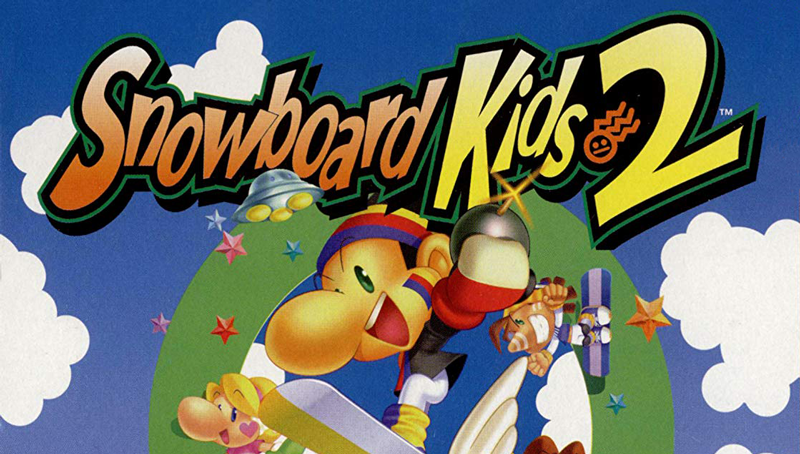 Games like Cool Boarders and 1080 Snowboarding may have led the way, but Snowboard Kids was the first to put a more put a more playful spin on the snowboarding genre. Some may know Snowboard Kids 2, not because of its comical racing gameplay, but due to its rarity in the world of game collecting. Producing cartridges for the Nintendo 64 was an expensive undertaking for publishers in the late ‘90s, especially when compared to printing compact discs for the PlayStation. Snowboard Kids publisher Atlus was notorious at the time for their small production runs, and Snowboard Kids 2 was no exception. Already in short supply, the snowboarding sequel didn’t sell well enough to warrant a second production of cartridges. With scarcity comes value, and it wasn’t long until Snowboard Kids 2 was on par with Nintendo 64 mainstays like The Legend of Zelda: Majora’s Mask and Harvest Moon 64 in terms of worth. Today a used copy sells for around $40 in North America, which isn’t astronomical, but still decently expensive for a third-party title lacking any kind of “special edition” or “not for resale” status. It’s value is significantly higher in the PAL region, where it was only released in Australia, and remains one of the most highly sought-after Nintendo 64 titles to this day. Atlus did attempt to reboot the series in 2008, with the poorly-received SBK: Snowboard Kids for the Nintendo DS, but the game was a decidedly large step backwards in terms of both gameplay and overall charm. We haven’t seen or heard from the Snowboard Kids since. Often times nostalgia plays tricks on us. It tempts us into playing games we thought were undeniable classics, only to force us into the realization they were merely a jumble of colorful polygons that managed to entertain us at the time. I face this fear every year or so when I load up Snowboard Kids 2, worried the game is going to finally let me down. But it never has. The tight controls, wacky characters, and vibrant courses still hold up, at least in my book. Snowboard Kids 2 is the epitome of a cult classic, and I only hope that others have managed to squeeze the same enjoyment and mileage out of the game that I have over the past two decades. May it shred forever through our hearts.